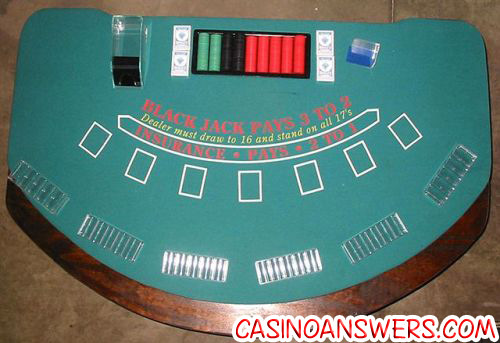 How Do You Play Blackjack? - Casino Answers! 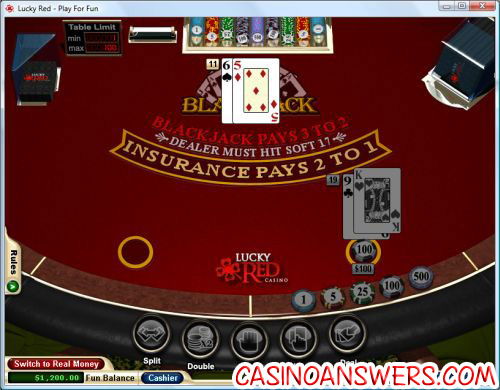 Casino Answers » Blackjack » How Do You Play Blackjack? Double Exposure Blackjack: 8 decks, Blackjack pays 1:1 odds, both the dealers cards are face up, and the dealer hits on a strong 17. European Blackjack Gold Series: 2 decks, Blackjack pays 3:2. Insurance pays 2:1, any other win is 1:1. The dealer stands on a soft 17. High Streak European Blackjack 2 decks, Blackjack pays 3:2. Insurance is a 2:1 payout, all other wins are 1:1. The dealer stands on ALL 17s. These, and 30 other types of Blackjack, are available at Gaming Club Casino. FYI if you are American then you can’t play there – you can head on over to Lucky Red Casino. As you can see they are very similar. 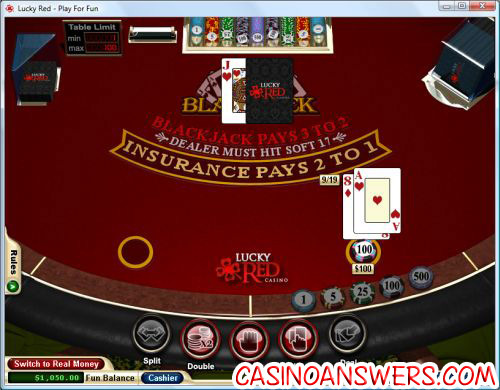 This screenshot and all future screenshots are courtesy of Lucky Red Casino which also offers Face up 21, Pontoon and Blackjack Perfect Pairs. Try them out today – click here. Okay, so how exactly do we play Blackjack? Well upon sitting at the table and prior to starting a new hand, you must place down your bet in the betting circle as indicated in the above screenshot. We should note at this time that suits do not matter. Now if the dealer had an ace showing, you would have the option to take insurance. What this means is that you can insure your hand against the possibility of the dealer having blackjack. 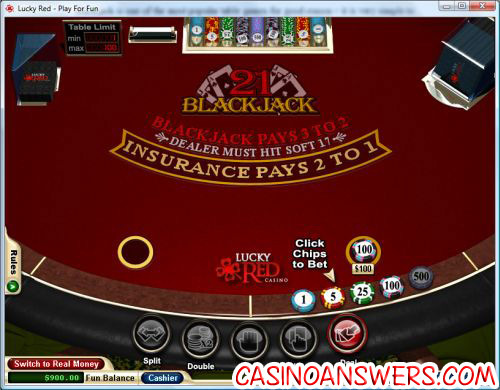 If the dealer has blackjack in his hand, which is a ten, jack, queen or king as well as an ace(which adds up to 21), the your bet pays off at two to one odds. The next step in Blackjack is deciding what to do. You will have a minimum of three options. They are “hit” which means you want another card, “stand” which means you are happy with your hand and want no more cards, and “double down” which means you want to double your bet but can only take one more card. So if you had a hand totaling 8, doubled down and got a 4 giving you 12 – you could not take any more cards. So now they must stick, even though they are tied with us(and we get our bet back based on this). Once the dealers hand is tallied and yours is tallied, the dealer will either take away your bet or give you your winnings, depending on whether you lose or win. And that is how you play Blackjack! It is a very simple game and very easy to play. Please, try it out for free at Lucky Red Casino and you’ll see just how easy it is. 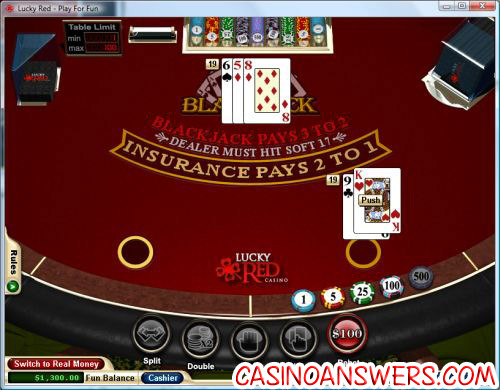 How to play Blackjack? Blackjack game guide? Guide to playing Blackjack? Complete idiots guide to Blackjack? Is there a complete idiots guide to Blackjack? Blackjack for Dummies?